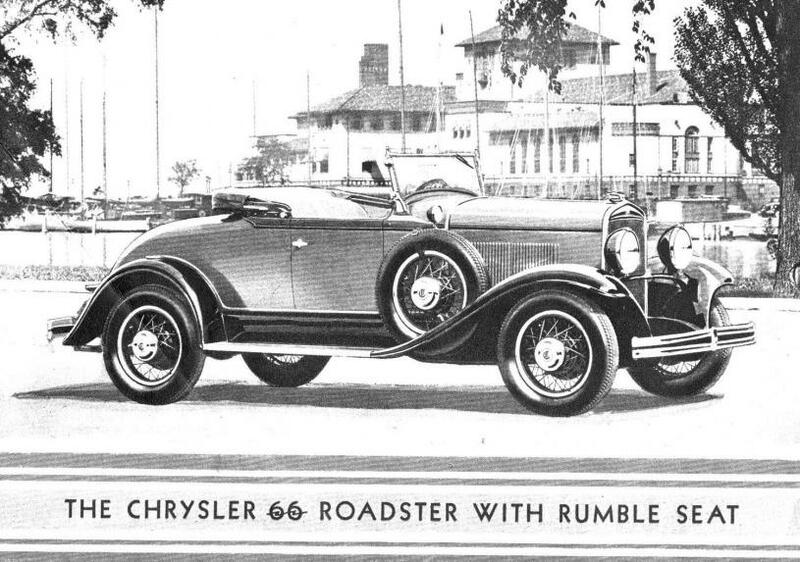 The 1930 Chrysler 66 Roadster with Rumble Seat was the least expensive of the Chrysler clan. Walter Chrysler was a railroad man who cut his teeth in the auto industry when he started to work for Charles Nash at General Motors. 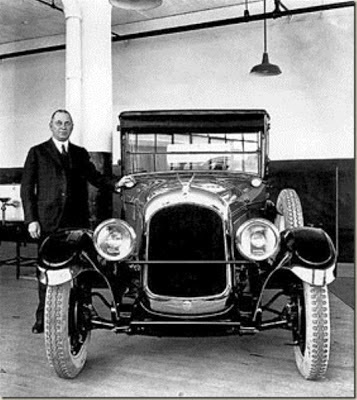 When Nash left GM in 1915 Chrysler stayed on at the Buick Division but he butted heads so often with Billy Durant--Nash's replacement--that he quit. His new job would be to rescue Maxwell and Chalmers from bankruptcy. Astonishingly, the two automakers were in the middle of a lawsuit brought about in a stalled merger. 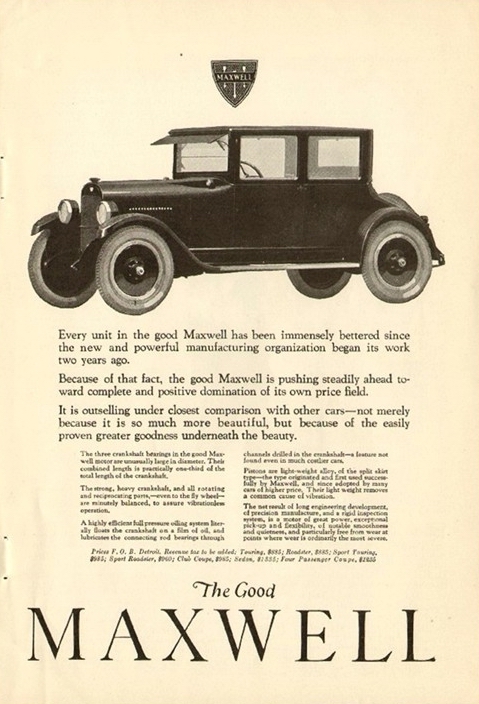 The 1923 Maxwell was billed as 'the good Maxwell." Maxwell recovered magnificently from Chrysler's magic touch, making a profit of more then $2 million in 1923. The Chalmers name was retired at the end of the season. Working with Zeder, Skelton and Breer--three brilliant engineers--they created a new car, one that would bear Chrysler's name on the radiator. It would be a more expensive companion to Maxwell. Chrysler borrowed $5 million to launch the Chrysler marque at the New York Auto Show in January of 1924. Walter P. Chrysler and the first automobile to bear his name. The Chrysler brand did well as did the revamped Maxwell line. Chrysler was designed to compete with higher-end nameplates: Buick, Nash, Studebaker and Hudson. Within a year the $5 million debt was retired. 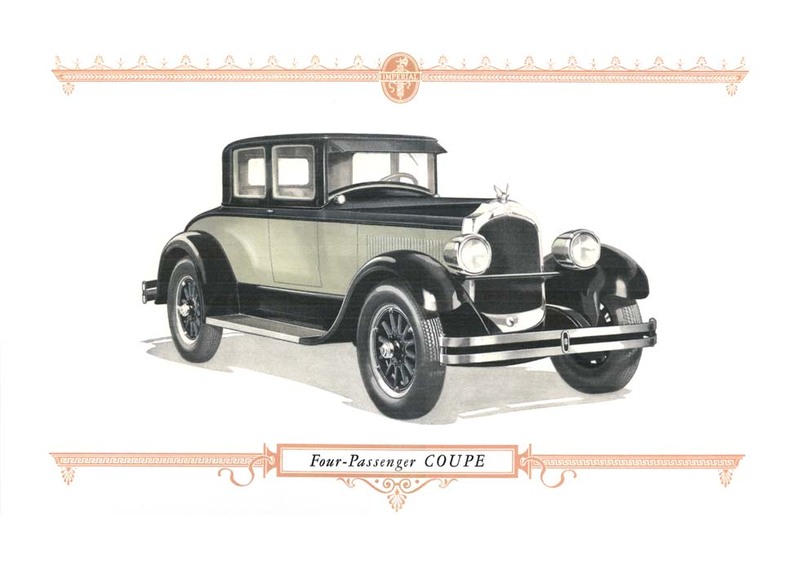 On June 6th, 1925 the Chrysler Corporation was formed with $40 million behind it. A week later Chrysler Canada Limited was established, taking over the Maxwell plant in Windsor, Ontario. With 181 employees on the payroll, Chrysler Canada workers turned out 7,857 vehicles that first year. The 1926 Chrysler Imperial Four-Passenger Coupe was as fast as it was beautiful. 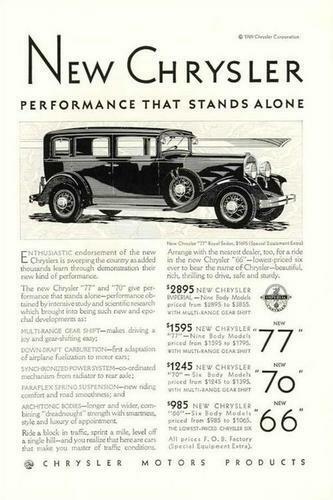 Chrysler's market was broadened considerably in 1926. Although the Maxwell name was dropped, the identical car was continued as Chrysler Model 58. Simultaneously the luxurious Chrysler Imperial was launched to compete with Cadillac, Franklin, Kissel, Packard and Pierce-Arrow. The company expanded quickly with a factory opening in Belgium that year and another in the UK in 1927. 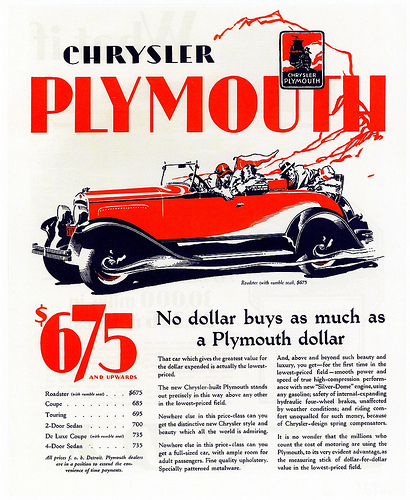 Entering the low-price field, Chrysler brought Plymouth to market on June 11th, 1928. Designed to do battle with Ford and Chevrolet, Walter was so proud of his four-cylinder baby that he commandeered the third one off the line and drove to Fairlane, Henry Ford's estate. He spent a pleasant afternoon with Henry and Edsel. Chrysler gave Henry the Plymouth and went home in a cab. DeSotos roll off the assembly line. 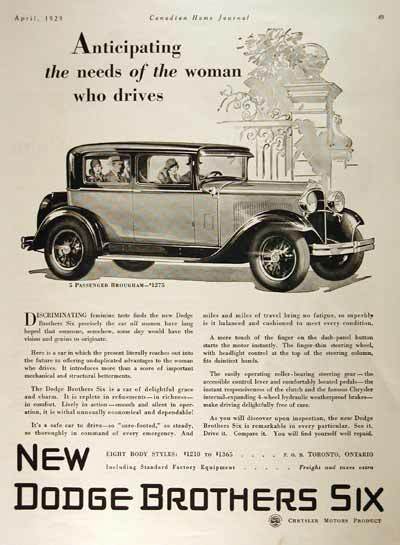 DeSoto was the next part of Chrysler's master plan, bowing to the public in 1929. The name was in honour of Hernando DeSoto, the 16th Century explorer who sailed up the Mississippi River and claimed much of North America for Spain. Planned as a lower-priced companion car in the corporate lineup, DeSoto fit neatly between Plymouth and Chrysler. It was intended to compete with Oldsmobile, Hudson, Nash, Studebaker, Durant and Dodge Brothers. 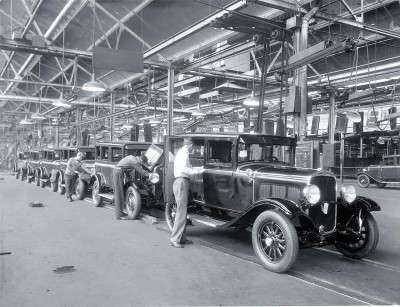 Dodge Brothers was especially targeted because it was the third largest automaker. Only Ford and the General Motors combine were bigger. The Dodge Brothers Six was offered to Canadians in eight body styles. Prices ranged from $1,220 to $1,365. Though the Dodge brothers had died of Spanish Flu in 1920, their widows shrewdly kept their shares in the company. Skillful managers from powerful Dillon Reed, the investment banker, continued to keep the concern in the black. Suddenly Dodge Brothers came up for sale. Chrysler snapped it up but DeSoto no longer had its intended spot. It was finally decided to market DeSoto between the low-buck Plymouth and the mid-range Dodge Brothers. When the stock market crashed in 1929 management at Chrysler quickly moved to weather the storm by cutting prices on Plymouth and assigning it to all DeSoto and Dodge showrooms. Suddenly Plymouth was available in more than 7,000 dealerships. The change-up was a wise move, one that ensured sales and profits during the worldwide business depression that would linger for nearly a decade. There was plenty of work to be done in-house aside from flogging Plymouth. Engine sizes were rationalized, some were weeded out. A new medium-sized straight-eight motor was introduced but to make it a volume seller, there were variations for Dodge and DeSoto. Models were carried over from 1929 with new ones inserted into the mix in the spring of 1930. Prices ranged from USD$835 for a Plymouth to the seven-passenger Chrysler Imperial Sedan Limousine that sold for USD$3,575. The 1930 Chrysler Imperial Sedan was the corporate flagship. All 1930 Chryslers made use of "Architonic" design. Steel was in vogue but the sales catalogue said that the finest hardwoods had been selected to reinforce the body, to give the greatest strength. The big news was the slim-shell radiator that was phared into the hood. Styling was done in-house and completed bodies were shipped from the Budd Company. 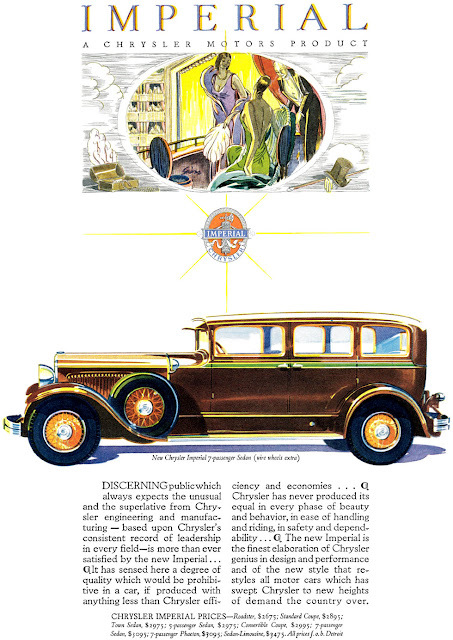 In 1930 Chryslers could be ordered with the latest technology--the radio. One could drive and tune in serials, news, soap operas, dramas, sporting events and live concerts. Radio sets came with distinct parts: an amplifier, speakers and a dash-mounted receiver. Batteries were stored in a galvanized compartment under the driver's seat while the aerial was hidden in the top of the body--a lead-in wire ran through the passenger-side windshield post.The cost was more than $100 and it took two days to install a radio in a vehicle. Introduced in January of 1929, the Chrysler 66 was sold for two seasons, through to the end of November 1930. The "66" stood for the rate of speed the car was capable of. The seven-main bearing six-cylinder Silver Dome engine developed 65 horsepower while the Redhead was a higher-compression version. Wheelbase was 112.75 inches and boasted an 11-gallon gas tank. Fuel flow was guaranteed by use of a fuel pump rather than relying on a vacuum unit. All Chryslers were equipped with Lockheed hydraulic brakes to stop those 18-inch tires. Available as a roadster with a rumble seat, Royal Coupe, Business Coupe, Phaeton, Brougham or Royal Sedan, the 66 Series ranged in price in the US from $995 to $1095. Here at home the price jumped up to $1,345. A respectable 22,606 units were built and sold in North America.